Pacman has what every good video game – and narrative for that matter – should have: motivation (fleeing from ghosts), reward (eating yellow dots), and obstacle (navigating a labyrinthine course). Best of all, it has familiarity. 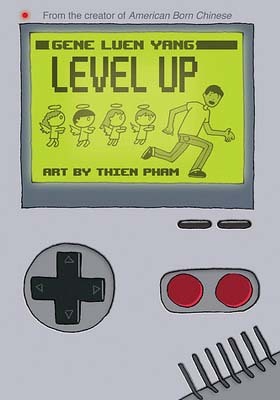 Level Up, by Gene Luen Yang, satisfies on all these counts, too. The story starts off with Dennis, the main character, sharing his first experience with an arcade. Many of us remember that moment, too: mine was at the dentist office (the only place I was allowed to play video games, mind you); game of choice? You guessed it, Pacman. This first scene of Level Up, set in an arcade, captures the rich memories of our childhood and evokes dreams of “what we will be when we grow up.” For me, it was the double-threat ballerina and waitress – seriously. Only later did I add physician to that list. Yang, in a daring task, explores the less romantic aspects of our journeys to our actual careers (because we don’t all become ballerina/waitresses or sky diving instructors or National Geographic photographers). Having no family members in healthcare, I have hesitated and doubted and somehow simultaneously dismissed and pursued the field of medicine. To be a physician has largely been an abstract goal that I did not have any real insight into and was, as many of my mother’s friends told me, a hard, maybe even thankless, journey (“Your mother will never get grandchildren!!”). I have been surrounded by peers who are, by necessity, driven, tireless, inspired…and I have craved a story of someone whose journey has involved the doubt that has been woven through my path to medicine. Yang’s book offers such a story; through the metaphor of a video game, we see the character Dennis experience different “levels” and multiple “lives” in his circuitous route to (and from) (and back to) medical school. Dennis is raised in a family with very clear “immigrant values:” study hard, work hard, become a doctor. Dennis’ father passes away early in the book and this is when video games become a big part of Dennis’ life. He struggles with the prescriptions of his parents but finds success in the world of gaming. When he is kicked out of college, he is visited by “fairy godparents,” imagined manifestations of his father’s expectations, who deliver to Dennis his destiny: gastroenterology. They manage to get him reenrolled in college and tend to his needs (I’m talking laundry, meals; it’s the works, people), so he can focus on his studies, much as his parents had always dreamed he would. As expected, he gets into medical school. Realizing that this is just the beginning of his labors, Dennis states, “The best thing about video games is you never have to worry about what you’re supposed to do…Everything’s cut and dried. The goal is always clear”(55). The remainder of the book explores the very tension at the heart of his goals. How does the stuff of our childhood translate into our life’s work? Yang ultimately suggests the two are compatible, that you need not give up the joy of video games to pursue higher, more sophisticated goals of, say, medicine. But, isn’t this such a familiar mantra in medicine? If I had a nickel for every time someone said “Oh you just need to get through [insert anything regarding this career path] and then it gets better.” So, you can imagine my sense of connection when Dennis’ father states, “To provide that boy with the life he has, I’ve had to eat much bitterness. He must learn to do the same.” Yes, I have learned to eat the bitterness of Saturdays at home in high school, organic chemistry in college, the lecture setting of the first two years of medical school…etc. I often find myself asking, “But isn’t this real life? Happening right now?” It marches forward without the promise of a replay. How much bitterness does one eat before enjoying life? Dennis teaches the reader that perhaps there aren’t strict “replays” or “additional lives,” but there is space for doubt. There is room for wandering, and that not all paths are bitter (or, at least, some have sweet to go with the bitter). We follow Dennis to medical school, we learn of the touching and ridiculous (why is everyone perfect!?) tales of other students who challenge him to “choose his own destiny,” much to the disgust of his fairies. But the life of a medical student is hard, and, after running into a college gaming friend, Dennis decides to drop out of school. He confronts his guardians (whom he refers to as “psychotic Kewpie-doll angels” at this point) and they ground him (you get that they’re channeling the spirit of his father at this point, right?). Dennis runs away from them and the set changes into, what else, Pacman. In a slight deviation from the original game, he must eat each of these ghosts. Hang in there: they turn out to represent promises his father has broken: to become a gastroenterologist himself and to make his son Dennis “better” than the engineer (note: not a doctor) he became. In this dream-like review of his father’s life – possibly the most powerful scene in the book – his father shares, “A happier man is a better man” (124). Well, this is all Dennis needs to feel that he has approval to pursue the dream of competitive video gaming (fact: this exists.). But, he still isn’t happy. Dennis laments that in “an average game of G.H.O.S.T. Squad, I save hundreds of lives…the only problem is – none of those lives are real”(149). In the pages that follow, there are video games messages: Game over. Play again? “Yes,” is selected. Dennis gets a second chance at medical school. While practicing a colonoscopy, the reader sees Dennis guiding a fiber optic camera, just like a video game, except this time, the stakes are real. In the end, Dennis’ destiny is ultimately gastroenterology, but he does not end up there floating on the dreams of his parents and the help of fairies – which is perhaps how many of us (or just me?) imagined our peers being delivered in a package of perfection to medical school orientation. Dennis’ story grapples with the role of family work ethic and personal fulfillment to derive a nuanced idea of “happy.” We discover (with Dennis) that despite his natural talent for gaming, he demands more than its clear goals and simplistic rewards. During a conversation about his father pursuing engineering to support his family, Dennis asks “Ma, did [Dad] regret it? Giving up med school?” She replies, “Tst. Stupid question! We do not regret the sacrifices we make for others, Dennis. Not ever!”(146). While perhaps a bit cliché (my favorite), Dennis finds the human impact of being a physician to be the critical factor missing from gaming. Level Up revolves around the cultural conceptions of “work” and the relationship between our identity and our profession. Of course, I am biased, but I believe medicine has long portrayed itself as an all-encompassing force that engulfs physicians: medicine is what we do, but it is also who we are. We are physicians before we are individuals(picture that passage from Sylvia Plath’s “The Bell Jar” where figs representing different, wonderful, mutually exclusive futures beckon and only one may be chosen). For me, this has been the sticking point; I am lots of things, not just my work (including avid reader of feminist literature). Further, in stark contrast to this homebrewed and internally perpetuated idea of the doctor-who-is-only-doctor is the competing notion of what “work” means to other peoples and cultures; Dennis shares his hesitations about medical school stating, “The work itself…I don’t know, Ma. I can do it. I guess, but I don’t know if I really love it.” She scoffs, “Love?! What is this love? Love is for people, not work!”(81-2). While not everyone views their job and their fulfillment as different, it seems that Dennis is brought back to medicine precisely for the love of people; he is able to care for patients and save lives that only happen once.